section are included with the Engine Package. 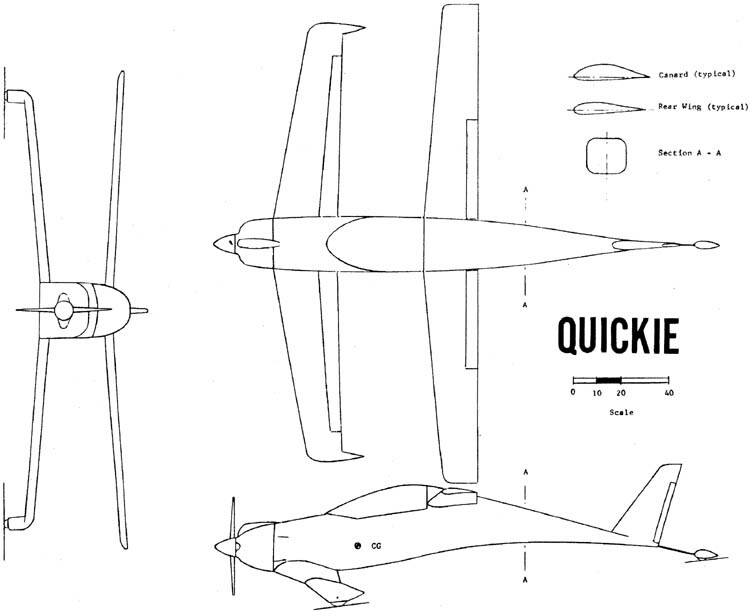 The Quickie is a medium performance, homebuilt aircraft. Its compact external size and extremely efficient design results in superb performance and unequalled fuel economy using a very low horsepower engine. Inside, it provides comfort for a pilot up to 6'5" tall and 210 lb, plus some baggage capability in the roomy compartment behind the seat. Its canard configuration was designed not only for performance, but to provide improved flying qualities and safety as compared to the conventional light plane. The Quickie's high-lift canard (forward wing) is fitted with a plain elevator that controls the aircraft's pitch attitude. The canard also serves as the main landing gear spring since the main gear is mounted on the tips of the canard. This feature results in a remarkably smooth ride as well as outstanding ground stability during taxiing, takeoff and landing. Roll capability is provided by ailerons on the inboard portion of the main wing. Yaw control is provided by a rudder mounted on the vertical fin, and is actuated by conventional rudder pedals. The pitch and roll capability is provided by a side stick controller on the right side of the cockpit. This feature permits precise control of the Quickie while reducing pilot fatigue and cockpit clutter. The tailwheel is actuated directly from the rudder pedals, without any springs, thus providing positive steering at all times while on the ground. Since the tailwheel is not raised on takeoff roll like other taildraggers, this positive steering is available until the aircraft is airborne, making for very safe takeoff and landing characteristics. Even though the Quickie has very low horsepower, it can outperform many general aviation aircraft while retaining unequalled fuel economy. The maximum speed is actually faster than a Cessna 150, and the fuel economy exceeds 100 miles per gallon. The composite structure of your Quickie provides some important advantages over conventional metal, wood, or fabric construction. It has been tested to loads far in excess of those required for FAA certification. Fatigue margins are higher. Contour is maintained underload, the structure does not "oil can," buckle, or distort. It provides excellent insulation and damps noise. It has no hidden joints, no water traps, and is far less susceptible to corrosion. It is easier to inspect, more redundant and easier to repair. It is not susceptible to thermal stress due to temperature changes. Properly protected from UV, it has an unlimited life. The engine that powers the Quickie is a reliable four-stroke, direct drive, two cylinder opposed, engine developed by Quickie Aircraft Corporation specifically for The Quickie. The basic engine on which the Quickie powerplant is based, is an industrial engine made by the Onan company, which has been building engines of this configuration for over 20 years.